I had a chance to visit one of Antalya's "halal" beach resorts and I couldn't help but cast my mind back to summer 2016 and the spasmodic eruption of media coverage about burkini bans and a 'culture clash' at the Rio Olympics. Whether on the beaches lounging or playing volleyball for one's country, Muslim women and their choice of dress were once again news fodder. Not that this is all that surprising. In their study analyzing media coverage of Islam and Muslims in the British nationals between 1998 and 2009, McEnery, Baker and Gabrielatos affirmed the media's fixation with Muslim women documenting a peak in news output in 2006, the year then Home Secretary Jack Straw penned a column to constituents in the Lancashire Telegraph about Muslim women attending surgery in a face veil and his discomfiture at what he saw as an unwelcome obstacle in MP-constituent relations. The peak was surpassed by news coverage of 9/11 and 7/7 but not, interestingly, other major terrorist incidents in that timescale. In their subsequent study, analyzing media output in the British nationals between 2010 and 2014, the peak of 2006 even eclipsed media output on the murder of Lee Rigby in 2013. Walking around the splendor of resorts like Women Deluxe and Adenya, it's easy to dispel concerns about the dominant perceptions of Muslim women refracted through the prism of copious and critical media coverage in the UK and elsewhere because nowhere are you likely to see these binary constructions dissipate more rapidly than at these halal resorts. I still smile at the memory of poolside aerobics and my encounters with Muslim women sunbathing in stylish swimwear. What troubles me is the absence of these smiling, happy faces in public perceptions of Muslim women and the exceptionalizing viewpoints which persist as a consequence. The onset of burkini bans in France last summer inevitably sparked debates across Europe about the private and public sphere and the 'clash of values' presented by Muslim women whose enjoyment of summer pursuits such as swimming or sunbathing push at the neat boundaries constructed externally around their religious identity and dress. Witness the photos of Muslim women being forced to discard their covering or ordered off beaches for 'violating' the rules. In an age of social media, the public and private spheres are perhaps more porous than ever as individuals post pictures inviting us into their most private spheres, but this boundary is one you will see carefully maintained at Muslim-friendly resorts, where mobile phones are sequestered before one can enter the women's zones, and on beaches around Europe where the burkini asserts the distinction adhered to by Muslim women when it comes to public and private. When YouGov conducted a poll following the burkini bans in France asking if Britons would support 'a law that bans people from wearing the burkini in public in the UK' the results showed that almost half of Britons would support such a law (46%). It doesn't help that YouGov's framing of the question is misleading, claiming that a burkini covers the 'body and face', nor that the question could be interpreted as partial with its characterization of the burkini in Islamic traditions as the 'purpose of hiding' the female body. The description plays more to populist notions of Muslim women being 'hidden' in plain sight than to an understanding of movement between public and private spheres and the dress codes that mediate it. Why would so many support a ban when few have encountered Muslim women and fewer still have sufficient understanding of Islam to appreciate the religion's maintenance of public or private spheres? Rane, Ewart and Martinkus argue that what most people think they know about Islam and Muslims comes not from direct encounters but from what they call a 'media-generated Muslims' discourse. Certainly, it's easier to appreciate why support for the way Muslim women dress on beaches commensurate with their faith identities has little support among Brits when you consider how the veil is framed in the British press. In their first study covering the period 1998-2009, McEnery, Baker and Gabrielatos categorized the depiction of the veil in the British press according to normative judgements which presented the veil as a garment women 'choose' to wear; are 'forced' to wear, 'demand' to wear or have the 'right' to wear. The categories tell us something about the media's construction of Muslim women in the British public sphere as interlopers (demanding to wear the veil) or citizens bearing the right to wear the veil, indeed as agents 'choosing' to wear the veil. The greater proportion of articles (61% of all articles) favoring the veil as a 'right' or a 'choice' is indicative of a discourse around 'media-generated Muslims' which is, in part, faithful to academic research which underscores the adoption of a rights-based discourse among Muslim women and thus making their life choices compatible with a feminist vocabulary in modern societies. But the picture transforms radically in the later study covering the period 2010-2014. As McEnery and Baker argue, in the later corpus veiling is presented as an 'issue'. Just how much of an issue can be seen from the repositioning of the veil within the categories. In the later corpus, a mutually intelligible discourse around 'rights' and 'choice' is diminished as negative discourses framing Muslim women as cultural aggressors, 'demanding' to wear the veil, or oppressed victims, being 'forced' to wear the veil, come to dominate. In my conversations with British Muslims I met who were holidaying at the various resorts on the familiarization trip, what seemed to resonate with all their accounts was the space afforded to Muslim women to be themselves and to enjoy all the pleasures associated with a summer holiday without hindrance or hubris. Indeed, one of the main factors considered by those opting for a "halal hotel" is the accommodation of separate facilities for use exclusively by Muslim women. I would imagine popular misconceptions would cast these facilities as being of lesser quality or geographically removed from the main, as if to suggest Muslim women were being hidden twice over. The reality couldn't be more different. Many of these resorts offer top-notch services to Muslim women with the square footage of their zones being no less comparable to the mixed sections or male sections with which they vie for attention. Careful thought has gone into making these spaces aesthetically pleasing. And who can blame entrepreneurs cashing in on the popularity of halal as a holiday option or the increase in the volume of Muslim travelers. Prejudice may silently creep, but its commerce that is making a noise here. Perhaps little surprise that HalalBooking.com registers high volume of trade among Muslims from European countries where the veil is more of an 'issue' than it is in the UK. Straight percentages are misleading given that the Muslim population in the various European countries varies greatly, but in the last year (2016) a quarter of Muslim holidaymakers choosing halal holidays were from Germany and almost 1 in 5 from the UK. Of the travel agents I travelled with, many of whom were from the UK, halalhas a growing interest among British and European Muslims and the sector is responding by making available a broader range of options from spectacular resorts like Wome Deluxe to holiday villages, such as Ak Palace in Belek. The "State of the Global Islamic Economy Report 2016/17" by Thomson Reuters and DinarStandards expects total global Muslim spend on outbound travel to reach $243 billion by 2021 with a CAGR growth of 8.2% (2015-21). According to the report Muslims spent an estimated $28 billion on beach resorts in 2014 and classifies beach resorts as a high growth segment. Its halal travel indicator ranks Turkey third in terms of best developed ecosystem for halal travel. Ufuk Seçgin, Chief Marketing Officer of HalalBooking.com explained: "Turkey and Antalya-Alanya particularly is the world's leading destination for halal beach resorts with more than 20 resorts dedicated to halal-conscious travelers in the Antalya region alone. 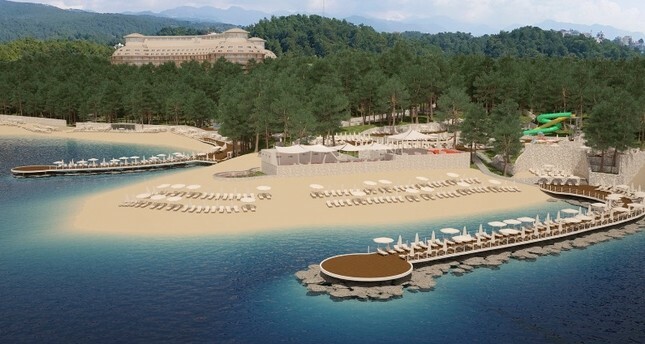 Turkey's halal beach resort sector has become a world-wide success and tens of thousands of guests from more than 70 countries have booked their stays in one of these hotels through our website so far." The potential is unmistakable and the need obviously a growing one. But I kept thinking what halal holidays would mean for the interpenetration of the media-generated Muslim discourse with actual experience and encounters with Muslim women? How to rebalance frames that have tipped too far to portray Muslim women as either victims or aggressors and shorn them of agency and rights? If summer holidays are an opportunity to widen your horizons and experience new things, I would invite those who frame the discourse on Muslim women in our media to go beyond their narrow vision because somewhere between the burkini in Europe and the bikini at a halal resort, you'll find a subject you've ignored or willfully misrepresented for far too long. *Shenaz Bunglawala was formerly head of research at MEND (Muslim Engagement & Development) where she led research into Islamophobia in the British media, racial and religious equality and the impact of counter-terrorism legislation on British Muslim communities. She is a director of the Byline Festival Foundation for inclusive journalism.